With eight of the Worlds ten highest peaks, Nepal is loaded with spectacular mountains vistas. The Everest trekking is justifiably famous not only for its proximity to the world's highest mountain but also for its friendly Sherpa people. Picturesque villages, great variety of cultures and traditions, colorful festivals and monasteries. The Sagarmatha National Park is rich with flora and fauna, but the existence of the Yeti remains a mystery. After a seven hours scenic drive to Jiri, we follow spectacular route via Solukhumbu area through the heart of fine Sherpa villages, each village having something new to offer. It offers an ample chance to explore beautiful forest, farming country sides and several monasteries situated at high elevation on the way to Lukla. Once one has passed Lukla, we climb on to Namche, the main trading village of the Khumbu area continuing via Thyangboche monastery to Pherche and Lobuche. The trek has got several numbers of attractions, chief of which are the spectacular scenery, the unique culture of the Sherpa people of the Solukhumbu, the region where Mt. Everest and its attendant lesser peaks are located. Take a morning tour of Kathmandu city after breakfast, and see all the main sights of the Kathmandu Valley, including the Boudhanath Stupa, Pashupatinath Temple, Swayambhunath Stupa (Monkey Temple), and Durbar Square. and discuss about the trekking for any final checks of your trekking equipment and clothing (sleeping bags, jacket, boots etc.). Today we take an early morning drive to Jiri, about 187 km north-east of Kathmandu. Since, we would be travelling on the mountain roads, it takes around 6-7 hrs to reach Jiri. From Jiri, we continue driving to Bhandar, our trek start point. Enjoy the views of Kosi River and panoramic views of the eastern Himalaya including Ganesh Himal, Langtang Lirung and Dorje Lakpa. Jiri is also known as the Switzerland of Nepal. It is very beautiful place. The beginning of trek is a gentle ascent for the first two hours to Mali Danda (2440m.) and then it follows a gently descending path to Shivalaya (1800m.) After Shivalaya the trail turns steeply up before turning into a gentle ascent to Deurali. You can enjoy the green scenery as well as some of the snow-capped mountains at a far distance. From Sete we gradually ascend to the Lamjura Pass (3530m.). From the Lamjura Pass we can see the panoramic view of the surrounding mountains. We cross it and then descend through the rhododendron, fir pine, magnolia, maple and birch forest and finally reach Junbesi. This day we cross the Junbesi Khola and then walk in the ascending slope through the forest. After some hours of climbing we see the amazing view of the mountains like Everest, Lhotse, Nupte, Makalu, Thamserku, Mera Peak, and many more. We continue the trail to Salung and then descend to Ringmo Khola. Again we walk up hill and cross Trakshindo La pass and finally descend down to Nunthala through the conifer and rhododendron forests, and terraced fields. This day also we continue climbing down to the Dudh Koshi River. Then we follow the Dudh Koshi River and walk up ward to Khumbu. Then we climb to Jubing. From there we walk straight and descend to cross a suspension bridge and finally ascend to Bupsa Danda. The first part of the trek is a gentle ascent for early 2 hours to Chiplung (2700m. ), a junction road to Jiri and Lukla passing through Mushe (2650m.). From this place, the road is quite broad and busy. Now, your trail is almost flat and gently descends before ascending again to Phakding. This is a short trek after 3 long days on the trail. You can hang in and around Phakding village. Trekking distance 10.5km approximately 6 Hours walks. After breakfast start trekking through a beautiful pine forest that leads us along the Dudh Koshi River and Hillary Suspension Bridge to reach to Monjo and starting point of Sagarmatha National Park. Here we stop at check post of TIMS & National Park permit. The trail passes through the Dudh Koshi, Bhote Koshi River, Jorsale village, Large Dovan and cross one of the highest bridge over the Dudh Kosi River of Everest region and reach to Chautara from where we can see the first glimpse of the Mt. Everest. Further walking about one hour steep up we reach to Namche bazar. Namche bazar is one of the trading points for Sherpa people. It is also ideal market for visitors to purchase traditional crafts. If you missed any trekking gears don't worry you can buy some trekking gears over here as well. Every Saturday there would be local street market, do not miss if you are there on Saturday. Today is the schedule for acclimatisation. However, we do not spend worth less at the lodge. It is highly suggested to climb up and stay overnight at low altitude so our body can adjust the high altitude climate. In the morning visit near by attraction; Sherpa Culture Museum and Everest photo Gallery, which is just 15-minute walking distance from Namche Bazar. From the museum you can have the spectacular picturesque Mountain View and take some photographs. Then start trekking to Everest view hotel passing through Syangboche Airport (3700m), which is situated at the highest altitude, takes about 2 hours. We climb further to reach Mt. Everest View Hotel for great panoramic views of Mt. Everest, Lhotse, Ama Dablam, Tawache, Kusum Kangkaru, Thamserku, Kongde and many more. Enjoy the spectacular view of mountains including Mt. Everest from the nearest destination then trek back to Namche Bazar. Take breakfast early in the morning and start trekking form Namche bazar to Tengboche. On the way trekking trail offers the spectacular majestic views of mountains and natural beauties. The trail passes through Kayangjuma, Sansa and descends about 300m and reach to Dudh Koshi suspension Bridge. After crossing the River the trail is steep up ascend about 500m and we reach on the hilltop called the Tengboche village. Tengboche is a wonderful place for scenic views of Mt. Everest, Mt. Nuptse and Mt. Ama Dablam and It has the biggest Buddhist monastery (3870m) called Tengboche Monastery. The structure of monastery for the first time was built I in 19 23 AD. In 1934, it was destroyed by earthquake and rebuilt. It was destroyed by fire again in 1989 and rebuilt with the help of volunteers and the provision of foreign aid. Explore the village, local people and the Tengboche monastery in the evening. Early in the morning if you are interested visit the Tengboche monastery for pray, ceremony in the principle and popularity of Monastery in Everest region. Try to be there before 7:30am, observe the monks praying and you can also involve there for pray. After breakfast trek from Tengboche to Dingboche, also known as Summer Valley, which will take approximately 6 hours. At first we trek via Debuche, cross bridge over Imja Khola and trek along the beautiful green fields, protected lands & the village of Pangboche (3900m). The trail is step up for entire day to reach to Dingboche. The village of Somare (4010m) and Orsho are on the way and offer the excellent view of Mt. Ama Dablam along the trail. We descend to the river and follow the steep up trail to reach the Dingboche via north face of the Pheriche village. Trekking about 3 hours from Pangboche we reach to the Dingboche village. Again it is necessary to take the day rest and acclimatize before go higher altitude, we spend our rest day in Dingboche. After breakfast with spectacular sunrise view over the mountain and admiring Ama Dablam to the South, Mt. Lotse and numerous other peaks. We hike to Chhukung which takes about 3-4 hours to explore the spectacular mountain, we can see the three out of six highest mountain in the world from the viewpoint, which are Mt. Lhotse (8516m), Mt. Makalu (8485m) and Mt. Cho Oyu (8201m) as well as you will you will see the peak of Cholatse (6440m) and Taboche (6542m) to the west. Then we back to Dingboche & rest in the evening. Trek to Lobuche via Khumbu Khola valley & Duglha (4530m) (also known as Thukla) that leads to the white Chorten on the top of the ridge. Then further continue through Dusa(4530m), Palrung Kharka and you will see the Chola peak and at the bottom Chola Lake (4590m) on the left hand side. At the top of the ridge we will find a collection of stones with prayer flags, memorials of several famous mountaineers such as memorial of US citizen mountaineer Scott Fisher and Nepali citizen 10 times Everest submitter Nepali mountain guide Babu Chiri Sharpa who perished on a mission to submit Mt. Everest. Along the way as the trail further continue to the Khumbu Glacier moraine, you witness a great view of Mt. Pumori (7161m), Khumbutse, Khumbu peak, Nuptse, Baruche, Lola peak and beautiful views of Himalayas. As we pass the Khumbu glacier moraine you might feel a little out of breath due to high altitude. Trekking to Gorak Shep passes through the lateral moraine of the Khumbu Glacier with the witness of north ridge of Mt Everest, Mt. Pumori, Mahalangur and Mt. Nuptse and surrounding peaks. Trekking after approximately 3 hours from Lobuche, we will reach at Gorak Shep. Take Lunch at Gorakshep and have rest for a while. Gorakshep is the last place where you stay . From Gorak Shep continue trekking to reach Everest Base Camp, which is one of the ultimate destinations of our trekking and will take approximately another 3 hours. On the way we pass through the large icefall and glacier and after walking one and half hour we see the first glimpse of Mt. Everest. Hiking through the trail with several ups and downs in the high altitude, we explore the lovely and vibrant beautiful views of Snowcapped Mountains and icefall glacier. When we reach to EBC we will enjoy the natural magnificence of Khumbu Glacier and icefall, people staying in the tented camp and some of enthusiastic mountain climber doing the preparation for Everest expedition. We will spend some time at the base camp enjoying the Himalayan beauty and capturing the majestic views in our cameras. Then trek back to Gorakshep. 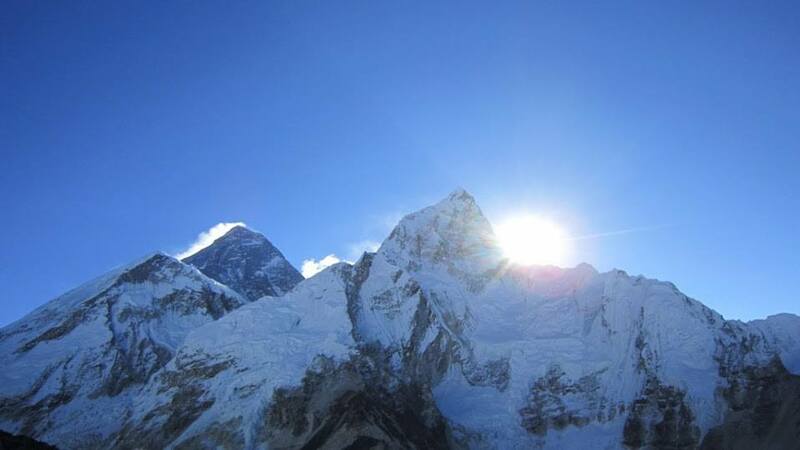 Get ready for tomorrow as we wake up early in the morning for sunrise views from Kala Patthar. Today is the toughest day for us of entire trekking. We wake up at 4am in the morning and start hike to Kala Patthar for spectacular sunrise view and massif of mountains. It will take 2-3 hours to reach to Kala Patthar from Gorakshep. A long but truly an exciting and adventurous hiking will finally land us in Kala Patthar & explore majestic views of mountains such as Mt. Everest (8848m), Mt. Pumori (7161m), Lola peak, Khumbutse peak (6640m), Baruche (7129m), Nuptse (7861m), Ama Dablam (6856m), Kangtega (6685m), Thamserku (6608m), Lotse (8516) and it’s range, and last one on the far right hand corner is the Tibetan ranges. We will enjoy the panoramic views of Himalayas and capture the moments in our cameras. This moment is one of the unforgettable alive memories for the rest of our lifetime. Remember you might feel very cold and lack of oxygen, water bottle might get frozen, mobile and camera might not work. Do not forget to get thick warm clothes and protective equipment such warm cap and gloves. We don't stay at Kalapathar for long as it is freezing weather. We spend about half an hour and capture all the memories in our camera as photo and video then descend back to Gorek Shep, take about 1 hour. Take breakfast and then descend to Pheriche (4210m) via Lobuche and Thukla. After descending 2-3 hours from Gorakshep we reach to Thukla where we will have lunch. It will take another one hour descend exploring the river and Pheriche valley to get Pheriche village. Start trekking Pheriche to Phortse village (3810m). The trail passes witnessing the wild animals like mountain goat, musk deer and many species of himalayan birds. There are monasteries at Pangboche and Phortse village rich in cultural heritage of the Sherpa people living in the Everest region of Nepal. The monasteries in this village were built during the 16th century and the culture & tradition still remain unchanged. About 3 hours descending from Pheriche we reach to Upper Pangboche village (3930m). It is popularly known as the village situated at the highest altitude on earth. From Upper Pangboche the trail divide in to two branch. One goes to Tangboche if you descend but we take straight further to go to Phortse village instead descend, this trail avoids much of the trekkers and yak traffic. It will take 3 hours to reach to beautiful village Phortse from Pangboche. Finally we return to Lukla where the trek began, which will seem like a lifetime ago. Enjoying time to reflect on the trek as a group and the personal achievement of all those who took part. Also giving you time to explore the town. Fly from Lukla to Kathmandu will take 30 minutes of amazing scenic mountain flight lands you in the domestic terminal of the airport. Up on arrival in Kathmandu, transfer to the hotel and in the afternoon enjoys as leisure. Remember there is high chance of cancelling flight because of the weather condition. We do have some evidence trekkers had to stay for 3 days because of the weather condition. So be prepared and make one leisure day in Kathmandu so that you can be safe. It's also spare day in case of bad weather in Lukla. Remember, there are high chances of cancelling flights because of weather condition in Lukla. You have option to stroll around the local tourist market in Kathmandu to observe the living style of local people in Kathmandu valley. You can observe the traditional houses, arts and crafts, local people selling clothes, fruits and vegetable around Indrachook and Ashanon located on the North Part of the Kathmandu Durbar Square. Transfer to the airport by private vehicle according to your flight schedule.